for once I managed to get the “925” sterling silver stamp level. I have a knack for messing it up, but not this time! you’d have to try it on to know how comfortable it wears! You can’t really see it on the first two pictures, but the ring isn’t round -it’s a little lopsided. On the back, the oval base and the ring don’t fit perfectly (although they’re soldered and strongly connected) and there are some unaesthetic gaps. 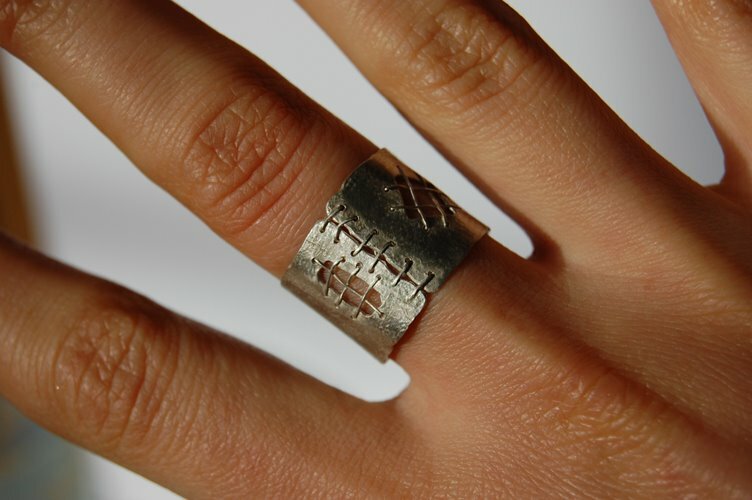 So I guess this one will have to stay in my own collection… 😉 And next time I work on rings of a similar design, I know how to fix it. Back to business: meet the new projects! Here are some of the results fo the 1st semester: on the left our assignments in brass and another alloy which name i always forget (it’s the paler metal in which the bracelet and that one ring is made). 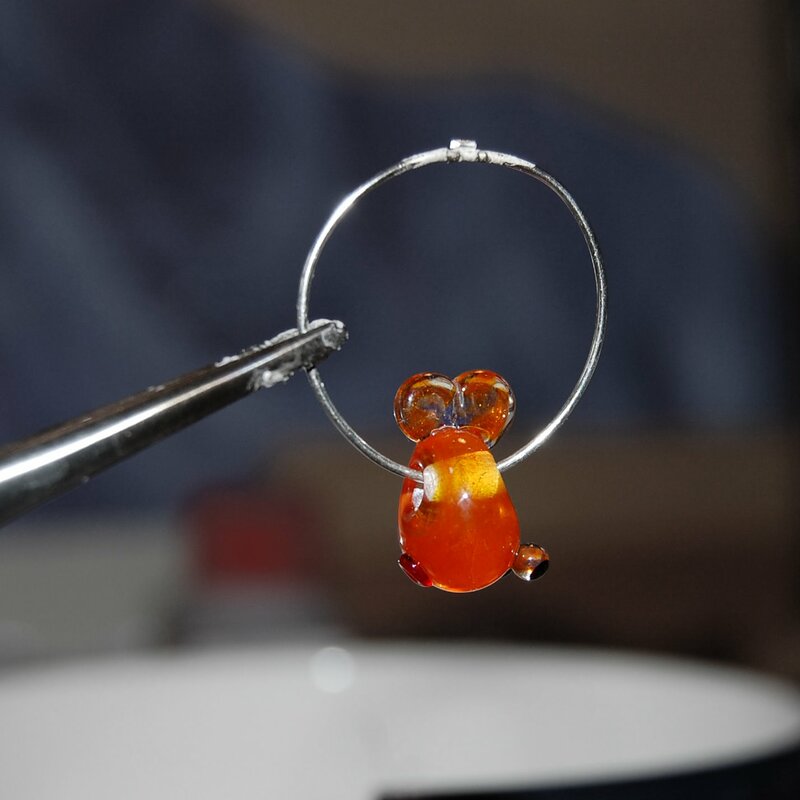 But now it is getting pretty interesting… designing a necklace on our own. Woohoo, now we’re talking! So it took me two full days of sawing, texturing with linen cloth, drilling, sewing, soldering and forming the metal…didn’t add stones yet, but I might with a next project. 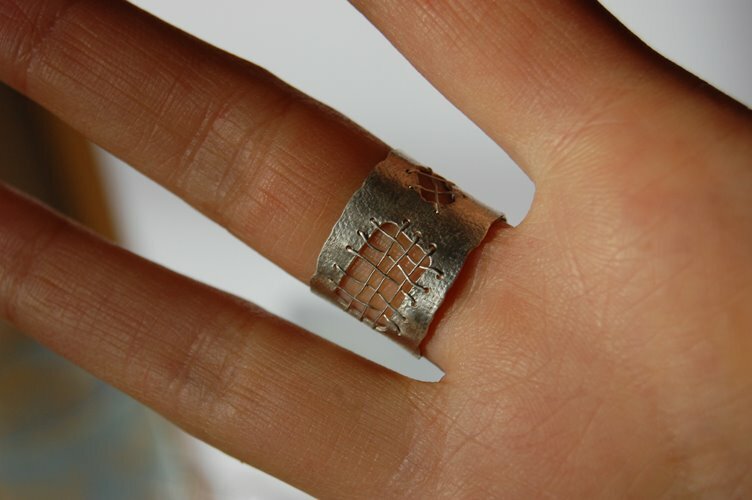 And this ring -at least the stitches- is your next clue for The Project! :-p Don’t get your expectations too high, it’s just something I’ve been planning on doing for quite some time but I fear it won’t be until the summer vacation, after library school has finished. Don’t worry, he survived! LOL. Today he became part of a new fishy necklace. You’ll soon see more of that! No new jewels just as yet but here’s a new photo of my lucky goldfish!